Hey you! I have neglected this place for a bit but for good reasons. We are working on some home improvement projects for our second floor. We started with the boys room on Thursday. I helped Leao remove all of the furniture, clothes and books. 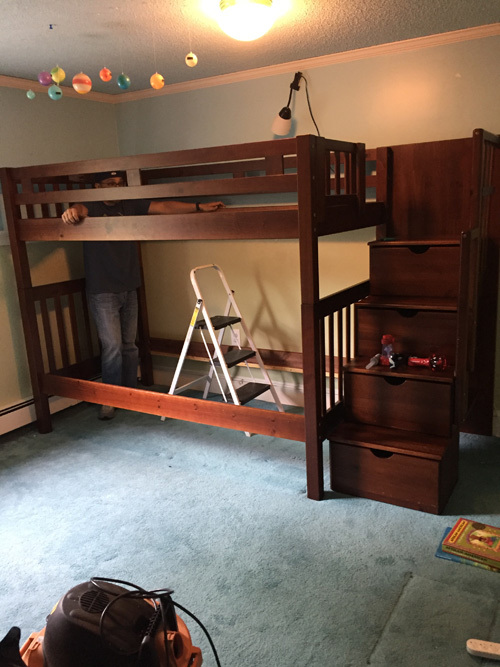 We disassembled the boys’ bunk beds and put their beds in our room while we work. 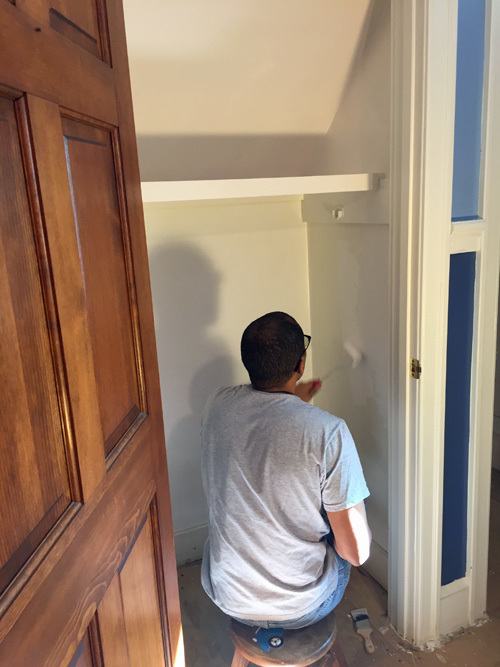 My father-in-law came to help my husband remove the dreaded popcorn ceiling (which we tested first for lead) and then removed the carpet in the room. 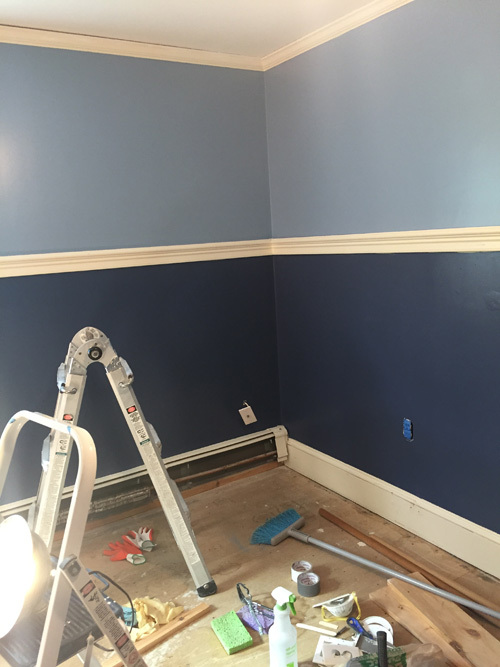 The last time we painted the boys room was about 12 years ago and I picked Disney colors. So they needed some big boy colors this time around. 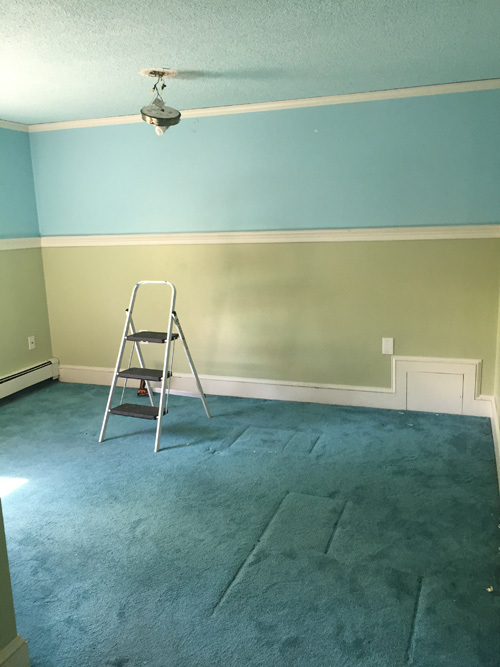 Above is the original colors and the carpet. 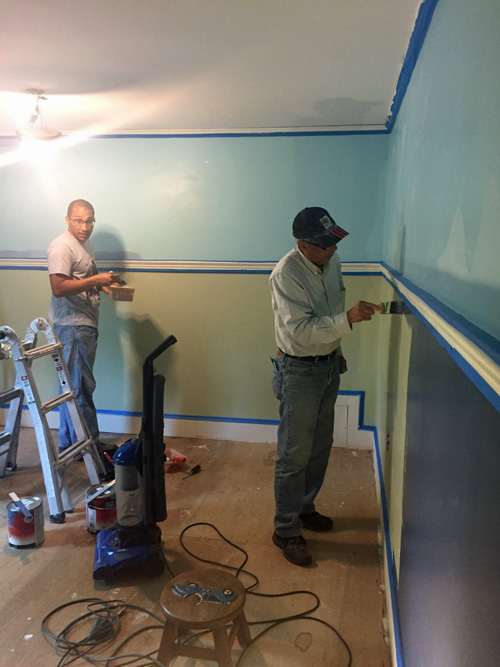 Above is them painting after they taped it all up. This is the new color which will allow me to add accents in their favorite colors (orange and black). They originally requested we paint it orange and black. I told them no, that they have to live with this a while but that I can find accents and comforters in the colors of their choices. Today we will be ordering the bamboo flooring for their room. I am really looking forward to a much cleaner and allergy reduced area. The flooring has too sit out 5 days before it can be installed so that it can expand prior to installation and it takes up to 7 days for the flooring to arrive. I am hoping that it comes fast so that we can wrap up their room in another week and a half. Once their room is complete they will order the bamboo flooring for our room and begin. Which I am really excited about since we always said we would do our room last and 12 years seems like long enough to me. So I want to go bold and do something sophisticated for our private space. So between the fact that all sorts of items are being stored in my craftroom, tending to my garden and keeping up with the year-end calendars of my boys, I will not be able to work on Belinda’s Crafts work for some time. I usually take the summer off but this is a bit early. This explains why you have been M.I.A. For a while. It looks great! I can’t wait to see it completed!